“Liar, liar, pants on fire” is an old schoolyard chant. Daphna Baram, the Israeli-hating descendant of the illustrious Baram family, was caught with her pants brightly burning in today’s Guardian. • This article was amended at 14.10 on October 29. The earlier version stated, on the basis of an Israeli newspaper report, that the book is being used in Palestinian Authority schools. That statement was removed at Daphna Baram’s request after readers questioned its accuracy. 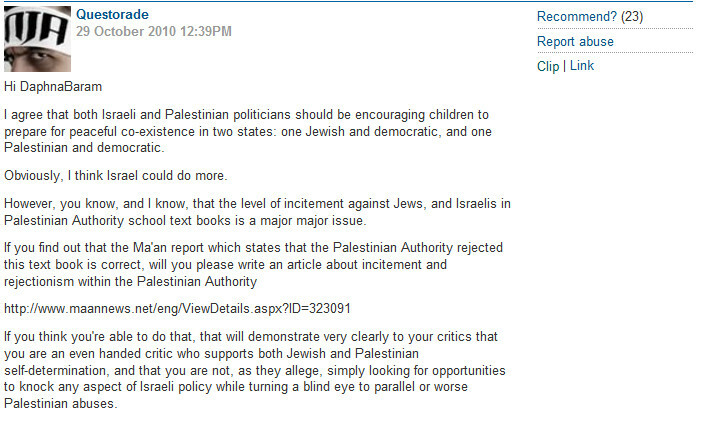 Readers not only questioned its accuracy – they cited chapter and verse from the Palestinian Authority that completely contradicted her and the report from the “Israeli paper”. That paper was, of course, Ha’aretz, where it ran on October 11th with a follow-up on the 25th. The comments on the thread show Ms Baram gradually shifting in her chair as her pants feel increasingly warm. So Baram simply decides to take her ball and go … to lunch! Questorade, like C.P. 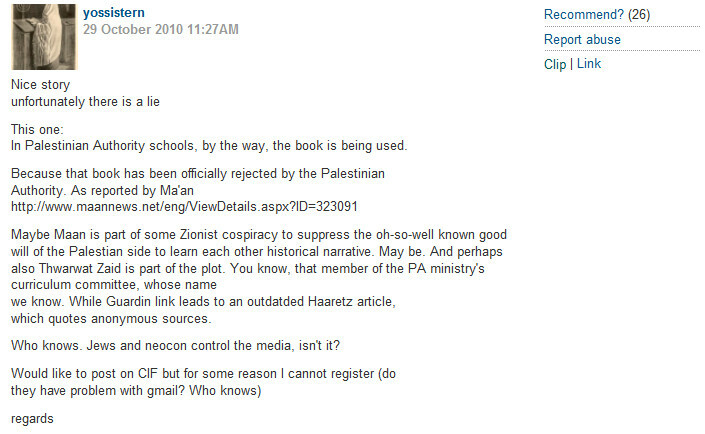 Scott, apparently thinks that facts are sacred, but Daphna Baram feels (like her friend Ilan Pappe) that lies are immaterial to the main point and will have none of it!! When will the Guardian learn to check the facts before allowing Israel-hating bloggers to use its site to spew their lies to a gullible readership? Dafna Baram does’t wear pants,don’t ask me how I know. 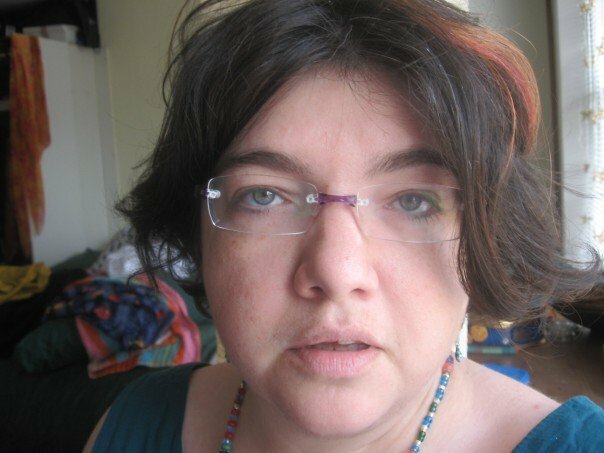 Daphna Baram is an absolute disgrace. Another classic Guardian moment. Hawkeye. A truly bizarre article and one that giver insights into Baram’s disturbed state. She is very much suited to The Guardian. Yeh. It takes the concept of self-hatred to a whole other level. Bizarre alright,a very disturbed person that is being exploited by the Guardian,there seems to be a pattern here,most of these people that write for the Guardian,whether they be Jewish,Israeli,or whatever seem to be loopy. The first few lines enough were enough for me. When will the Guardian learn to check facts…….Facts what is that.Please don’t confuse them. You should have warmly welcomed her decision not to spoil the gene pool. Daffy Baram should have had her lunch delivered to her desk so she would have the time to investigate the claims, and correct the record. Or maybe they couldn’t fit her lunch trough in the elevator, sorry “lift”. The child in her head……….Is this child being conceived in another immaculate conception.Free from all stain of original sin. That photo of her up there is creepy. We know more and more about how crucial is early mothering to emotional and physical development in adulthood as well as in infancy. One can only guess at the sort of distortions Baram would fill the head of any child. In some ways she would be worse, I imagine than the new Muslima on the block, Lauren Booth, not least because she seems to have more intelligence. That being the case I hope that Baram will never change what passes for her mind. Is it still called “back-pedalling” when you’re propelling yourself further downwards? “Not relevant” to the peace process? She should’ve stopped commenting at that point. Well, in fact she should’ve just checked her facts before posting the story in the first place. pretzel – actually, I think its the Guardian’s obligation to check the facts in the articles, since it is reasonable to assume some bias in any contributor’s article, and unlikely that they will take the time or trouble to identify the errors in their own article. That, in a way, is the fundamental difference between a publication that holds itself out as a reliable main stream source of news and bloggers (like me, for example). We expect bloggers to be biased, but we expect MSM to check the facts when they publish or have people publish under their banner.